It’s the Squid that got your attention isn’t it? Tell the truth. I won’t judge! Who could resist the thought of Christmas with squid! Yes! 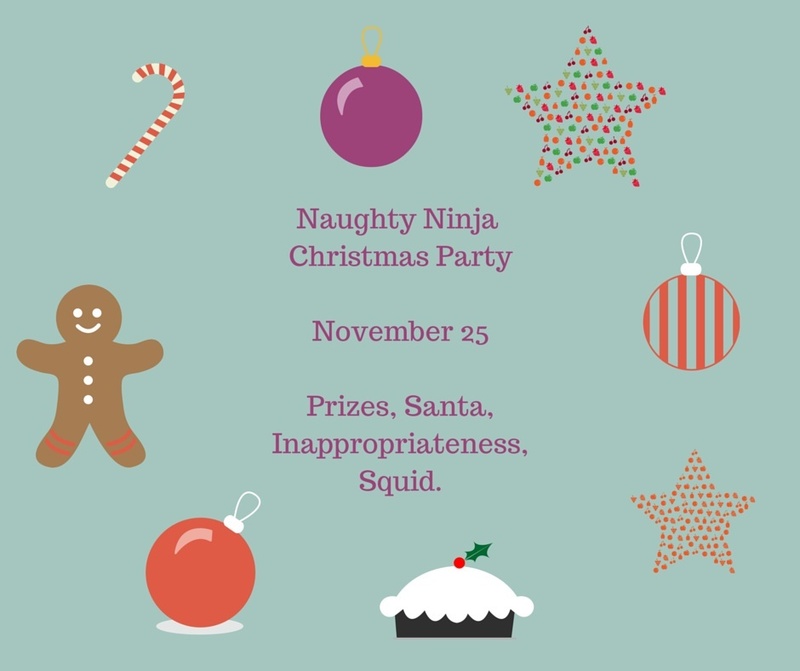 There will be tentacles as part of our Naughty Ninja Christmas Party on Facebook on November 25. If you don’t know about the naughty ninjas, you can visit us here… I’m Lily ‘Beanie Queen’ Malone and I’m part of the ninja madness. In true ninja fashion we intend to do Christmas very naughty, and all kinds of wrong. We’re sneaking up on Christmas in November, because being sneaky is what ninjas do! To join us, please visit our Facebook page on this link and click “going” and you’ll then get great reminders nearer the day. I’ll also tell you what my special ninja prize will be for the day, and all about my competition for the party. HINT: It involves very naughty and inappropriate Christmas carols!